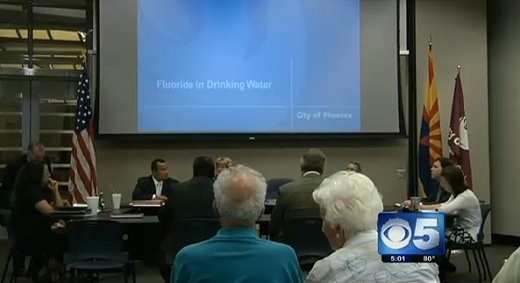 A City Council subcommittee decided to keep adding fluoride to the city's water. Four members of the City Council decided Tuesday the issue wasn't worthy of a full vote. Chemist and former senior scientist for the Environmental Protection Agency, Bill Hirzy, said the city rushed to judgment. "For this subcommittee to not even bring this question to the full council for a full vote seems like a dereliction of duty to me," Hirzy said. Hirzy said the chemical that's used in Phoenix is a toxic waste of the fertilizer industry. He said that it has been linked to problems with the brain and bone cancer in young children. Hirzy was shocked to find out none of the council subcommittee members attended last week's fluoride debate. "They're going to make this momentous decision to keep putting this stuff in your water and not caring enough to go to a real, honest-to-God debate between a pro-fluoride person and an anti-fluoride person," Hirzy said. "Basically they voted to keep putting a known toxic agent into the water." Representatives from several Arizona medical organizations who support fluoride were also on hand. "What Phoenix has been doing for 20 years is simply adjusting the fluoride to the optimal level that is recommended by the CDC," said the director of public health and research for the Arizona School of Dentistry, Don Altman. More allegations have come to light involving a West Palm Beach children's dentist. Dr. Thomas Floyd was arrested last week for child abuse, for allegedly punching a 4-year-old boy in the mouth back in May of 2010. Now another parent says her child was punched too. The girl, who's now 14, remembers what happened. Crystal says Dr. Floyd was not charged in that incident 11 years ago, because police told her they didn't have enough evidence. There were no eyewitnesses and police couldn't take the word of a 3-year-old. Dr. Floyd is free on $3000 bond. The United States Department of Labor is suing a Bath dentist for allegedly retaliating against two dental hygienists who complained about improper infection-control procedures at her practice. The complaint filed in U.S. District Court alleges that Dr. Tammy Cook, the owner of Bath Family Dental, discriminated against the hygienists, Dorothy Shafran and Chelsea Huntington. The suit seeks lost wages, benefits and compensatory and punitive damages for Shafran and Huntington. "We deny the allegations, we feel we have meritorious defense. We intend to vigorously litigate the case," Robert Kline, Cook's lawyer, said. He said one of the defenses will be that the underlying complaint was not made in good faith. The hygienists told Cook about their concerns about perceived lapses like failing to decontaminate treatment rooms and failing to wash hands or wear gloves, but the situation did not improve, according to the complaint filed Friday. It's a dental story told so often it borders on cliche. When someone moves to Portland from another state _ and that's most people you meet in this city of transplants _ their new dentist takes one look at their excellent teeth and concludes they must have been raised elsewhere, a place that puts fluoride in its drinking water. "I have had several dentists comment on my and my children's teeth, saying: `Oh, I can see you grew up in Portland,'" Mary Lou Hennrich said. And that's no compliment, she added. Portland is the largest city in the U.S. that has yet to approve fluoridation to combat tooth decay, a distinction that could change at Wednesday's city council meeting. Mayor Sam Adams and two city commissioners have announced their support, ensuring a majority on the five-member panel. Fluoridation has been an emotional topic in communities across the country for more than 50 years, and continues to be in cities ranging from conservative Wichita, Kan., to a place whose unofficial motto is "Keep Portland Weird." Portland is considered one of the nation's most liberal, and the issue presents a clash between two progressive positions: the desire to improve the dental health of low-income children and the impulse to avoid putting anything unnecessary in the air, food or water. "The fact that Portland stands out as the largest U.S. city without fluoridation is not the kind of weird we should be," the mayor said. "This is causing pain to kids."